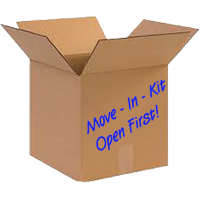 From all of the years we have been in this business, one of the most overlooked items to consider is your “Move-In-Kit”, otherwise known as your “Open First” box. This box should be transported with you, or be clearly identified for being loaded last / unloaded first on the moving truck. We have been to many homes while the furniture is being unloaded to see how things are going and so many times I here statements like “I wish I had kept my toolbox out” or “Don’t put anything on the counter, I want to clean it first”. A few of the items need no explanation, while others need a bit of imagination. Regardless, remember that the reason for this small kit is help keep you close by while arriving at your new house when the items are being delivered. If you run into the evening hours when the ambient light is low, you will have a light, food & water for energy, and with soap & towels for cleaning. For security purposes, often on moving day, you have no curtains and blinds put up and people have been passing by your home all day. I always recommend ordering in food for the first evening until you get your curtains or blinds up. If you have a security system, make sure it is up and running when you do go out.